«Summer Breeze» est une grande maison victorienne située dans le quartier historique de Shoreby Hill Green, juste en face de la plage d'East Ferry. À pied des commerces, des restaurants, et Newport Ferry. Un porche enveloppant surplombe une vaste cour avec de beaux jardins, des arbres d'ombrage matures, ainsi que le Shoreby Hill Green et la baie de Narragansett. Une cour clôturée comprend un pont de cuisine pratique avec barbecue au gaz et une douche chaude / froide en plein air après la plage. À l’intérieur, un spacieux étage rénové au 1er étage, avec de grandes fenêtres offrant une vue sur la baie, une cuisine gastronomique, un confortable salon pour petit-déjeuner / solarium, une grande salle à manger et un salon confortable avec cheminée. Le 3ème étage offre 1BR w / lits jumeaux et AC, une salle de bain avec baignoire sur pattes et grande salle de télévision avec futon Queen & AC, des vues spectaculaires sur la baie. This is a home. You’ll walk in and feel immediatately welcome and grateful to be on vacation. The Wassel’s are very organized and have everything prepared to make your stay an easy one. The house is clean and the beds are fresh. The views are stunning. It’s easy to pop down to the bay for a dip or fish off the dock. Bring a sweatshirt because I’m sure you’ll spend every evening on the porch and with the New England breeze you may need it. Thank you so much for the kind words. Jamestown is truly a special place! Our family of eight, including 2 young children, enjoyed a wonderful week. 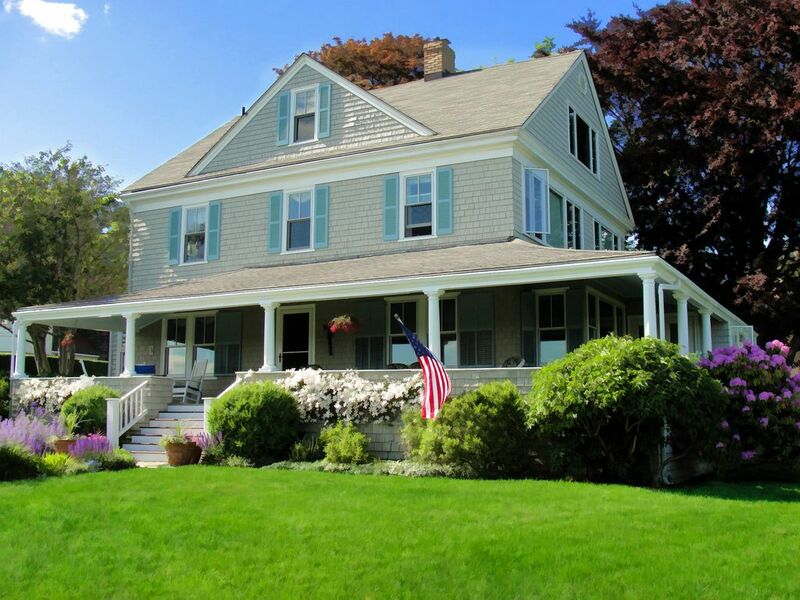 The views of the harbor and Newport Bridge are exceptional from both inside and from the wrap-around porch. The Master Bedroom Suite is very large and has wall-to-wall windows showcasing the water views. The home is very well maintained and decorated with a mix of country antiques and traditional furnishings. We loved the well equipped kitchen and the beautiful grounds. Great experience all round! Susan, we are delighted that you had such a good time, not only in our home but also, on our beautiful island. Jamestown is indeed a special place! So glad you had a great week, look forward to having you back! What a splendid house! The pictures give you a sense of the place; but the actuality is so much more. We gasped with delight when we first arrived. From the wrap-around porch to the five air-conditioned, well - appointed bedrooms to the open flow of the first floor, this house has been designed with ease and relaxation in mind. We were eight -- from Boston, New York CIty, and Portland,Oregon -- all in need of rest and no schedules. We found it all at "Summer Breeze." Special amenities: On the porch, a large and heavy table with benches, ideal for summer dinners. An easy five-minute walk to town. Spectacular views of the harbor and the Newport/Pell Bridge. Complete appointments in the kitchen, bathrooms, and bedrooms. We'll be back! Gorgeous property and gorgeous setting! Celebrated the 50th anniversary of my parents with 8 family members for the Fourth of July week at this amazing house! We were looking for a place that was centrally located near Newport but in a little quieter location and this home in Jamestown was it. Very well appointed and plenty of space outside to play games or just enjoy the summer days and nights. Walking in to town and driving/catching the ferry to Newport was only a few minutes away. You won't be disappointed with this opportunity to stay in a charming home that was the perfect New England experience for our family. Thank you so much! Family time is special and Jamestown is a special place! All I can say is that if you think the pictures of this home are gorgeous, you need to see it in person! It is an amazingly, well-kept property. Plenty of space and things to do. We went on a family vacation with small children, small pet and grandparents and it offered the relaxation and quality time we were looking for. Close beaches, small shops, yard to play ball and even just to lounge on the wrap-around porch and enjoy the views!! The owners are gracious to provide more than enough amenities to make it easy for those traveling a distance to stay. We will definitely look into coming back again next year! Thank you so much. Our goal is for all our guests to have a fun, relaxing visit! Jamestown se trouve au cœur de la baie de Narragansett entouré par l'eau cristalline bleu. Il offre une alternative calme du quartier animé de Newport, bien que ce soit un court voiture ou en ferry loin. L'île familial, propose de nombreuses activités amusantes tout au long de l'été, le 4 juillet feux d'artifice, des concerts gratuits le dimanche, et les règles de la régate Fool pour ne nommer que quelques-uns. Tout en explorant la riche histoire de l'île et la beauté des paysages que vous découvrirez Beavertail State Park à la pointe sud; Ft Getty avec ses bunkers de l'ère WW II; la Ferme Watson parmi ses nombreux trésors. Golf, voile, vélo ou quel que soit votre plaisir Jamestown est un endroit idéal pour se détendre et passer des vacances vraiment spécial.